Arsenal midfielder Aaron Ramsey has penned a four-year contract with Serie A champions Juventus ahead of a summer move on a free transfer. Arsenal superstar Aaron Ramsey will join Italian heavyweights Juventus at the end of the season, after agreeing a four-year deal with the reigning Serie A champions, the club confirmed on their website. The 28-year-old Welshman is set to bring an end to his 11-year association with Arsenal and walk away on a free transfer when the curtains fall on the 2018-19 campaign, having failed to agree terms over a new contract with the North London outfit. Ramsey signed for Arsenal from Cardiff City in the summer of 2008 and despite having faced hardships in the initial parts of his career with the Gunners owing to injuries, the Wales international had grown into an integral part of the team in recent years. The 28-year-old has racked up 361 appearances for the North London outfit till date, scoring 64 goals and registering 68 assists. During his stay at the Emirates Stadium, Ramsey has won three FA Cups and two FA Community Shield titles. In the ongoing term, he has netted three goals and set up seven more from 30 matches in all competitions. A report from BBC Sport claims that Ramsey had held talks with Spanish champions Barcelona and French champions Paris-Saint Germain once it became clear that he will be leaving Arsenal, while there was interest from Bayern Munich, Inter Milan and Real Madrid as well. However, the former Cardiff City midfielder has decided to join hands with Juventus, signing a four-year deal worth a whopping £400,000 a week, as per the report from BBC Sport, which makes him the highest-earning British player ever. Following the announcement, Ramsey issued a statement himself on his social media account. 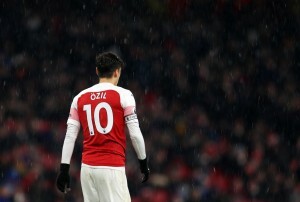 He wrote: “I wanted to issue a personal statement for all the Arsenal fans who have been extremely loyal and supportive. You welcomed me as a teenager and have been there for me through all the highs and lows I have encountered during my time at the club. Ramsey becomes the latest in a series of high-profile free transfer signings that Juventus have made in recent years. Last summer, the Italian champions recruited Emre Can from Liverpool once his contract ran down, while they have previously signed the likes of Sami Khedira, Dani Alves and the legendary Andrea Pirlo in similar deals.